3.1 How Big Is Your Yard? Finding the best lawn sprinkler isn’t easy. This post reviews some of the top sprinklers on the market and brings you a buyers guide. We found the GARDENA 1975 Aquazoom to be the best lawn sprinkler available to date. To find out why keep reading! In this section of the post we’ll be reviewing some of the top garden sprinklers available to date. Highlighting the features of these great sprinklers will help you identify and underpin exactly what it takes to make a great lawn sprinkler. Below we’ve listed 6 of the best lawn sprinklers which you’ll be sure to love. The first sprinkler that we reviewed is an adjustable oscillating sprinkler with fully adjustable width control. Meet the Gardena Aquazoom. The Gardena Aquazoom sprinkler is a member of the original Gardena family system of products. Gardena is one of the top-rated garden manufacturers based in Germany. This Aquazoom sprinkler comes equipped with fully adjustable width control for effectively managing your coverage area and is ideal for watering large rectangular areas. The Aquazoom promises to delight and meets your lawn care watering needs by providing almost 3900 square feet of coverage for lawns, gardens, fields, landscapes and other outdoor rectangular areas. The Gardena Aquazoom boasts a fully oscillating sprinkler head that comes with a full 12-month part and labor warranty. In the event that there is an issue with this sprinkler within the first 12 months, the manufacturer promises to deliver a completely repaired or replaced unit with no questions asked. If you’re in the market for an oscillating sprinkler to cover varying sizes of rectangular landscapes, the Gardena Aquazoom may be just what you’re looking for. The Melnor XT was designed especially large yards and lush landscapes in mind. The Melnor XT has a coverage range that is adjustable up to an impressive 4600 square feet of outdoor space. This beautifully designed metal sprinkler is equipped with a total of 20 precision nozzles allowing for multi-directional adjustments. The Melnor XT has Twin Touch control that adjusts the width and flow to cover an entire yard or smaller narrower areas like flower beds. The Melnor XT also features Zoom Control and an Infinity Drive for precision sprinkling and even watering that your lawn will appreciate. The next sprinkler that we reviewed is the Orbit Brass Impact sprinkler. The Orbit is the cream of the crop when it comes to lawn care that requires the use of impact sprinklers. This beautifully crafted sprinkler arrives on a wheeled base and sits on large sturdy wheels that prevent the sprinkler from tipping over from high water pressure pushing through during watering sessions. This sprinkler can stand on its own or be connected to a series of other sprinklers to cover a larger or more complex landscape. The Orbit Brass Impact sprinkler is fully adjustable to reach a large coverage area of up to 80 feet. The Plemo Lawn Sprinkler is a power-packed rotating sprinkler featuring 3-heads that provide 360-degree coverage. This sprinkler features a teal finish with brass fittings for leak control. There are 2 sprinklers included and both include sprinkler heads. Featuring 12 spray nozzles for a combined total of 24 spraying nozzles. The Plemo Lawn sprinkler is best used for watering oversized lawns, fields, and gardens. The Plemo Lawn Sprinkler also features an added bonus of an Anti-Leak design. This is fully equipped with brass fittings to prevent leakage and water loss during your watering sessions. This sprinkler is constructed with thickened ABS materials to ensure long lasting durability and a strengthed frame to prevent movement during high-pressure watering. The Melnor XT Oscillating Sprinkler introduces us to another member of the Melnor sprinkler family. The Melnor XT Turbo is an oscillating sprinkler that has a built-in 3-way adjustment feature that allows you to control the range, width, and flow for this model. Twin Touch control provides functionality for watering small or narrow areas and is adjustable for watering large areas and gardens. The Melnor XT features Zoom Control and an Infinity Turbo Drive for zooming in and out of large and small areas while providing even coverage. The GrowGreen Garden weighted rotating sprinkler boasts 360-degree rotation for full coverage of medium to large sized yards. This GrowGreen sprinkler is designed with a heavy weighted frame to prevent movement during high-pressure watering sessions. The GrowGreen features a 32.8-foot spray distance and is ideal for maintaining small to medium sized lawns and garden areas. This rotating sprinkler has 3 sprinkler heads with 12 built-in nozzles for even circular coverage. The built-in nozzles have a multi-directional angle for sprinkling hard to reach areas. The GrowGreen has dual connectors for attaching two garden hoses or connecting to additional sprinklers for expanded coverage. The sleek rotating nozzle body promises to deliver smooth and even coverage. Now that we’ve reviewed some of the best lawn sprinklers out there in 2018, let’s move on to the basics of choosing the best sprinkler for your lawn and garden improvements. We’re going to take a look at some important things to consider when making your next sprinkler purchase in order to help you make a more informed buying decision. The size of your lawn is one of the most important factors to consider when choosing a new lawn sprinkler. Consider what areas you want to cover and the watering requirements for each area. For example, small flower beds and large plants have different watering needs. Start by measuring the area of your lawn to determine how much ground that you have to cover and if all of your landscape has the same watering needs. Your lawn size and landscape will determine what type of sprinkler will give you the best watering results without wasting water and leaving you with the healthiest lawn possible. If you have plants and foliage with different watering needs you may want to consider using more than one sprinkler or purchasing an adjustable sprinkler. Another important factor to consider when choosing your lawn sprinkler is movability. Are you looking for a sprinkling solution that you can adjust as needed or are you looking for a more permanent solution that will remain in place? Portable sprinklers can be moved often to suit your needs or landscaping changes while fixed sprinklers are often installed in one place and remain stationary. You can choose either option depending on your long-term landscaping goals, coverage needs and the size of your yard. If you have an oversized yard or landscaped area to cover, it may be best to consider installing a more stationary irrigation system to assure the best coverage and overall health of your yard without the added hassle of having to make repeated adjustments to your sprinkler system in an oversized yard. Consider adding a timer to your new lawn care regime. This makes sure that your lawn is properly watered on a consistent schedule. Battery powered timers help you control your watering schedule by automatically powering your sprinklers on or off according to the time that you set. 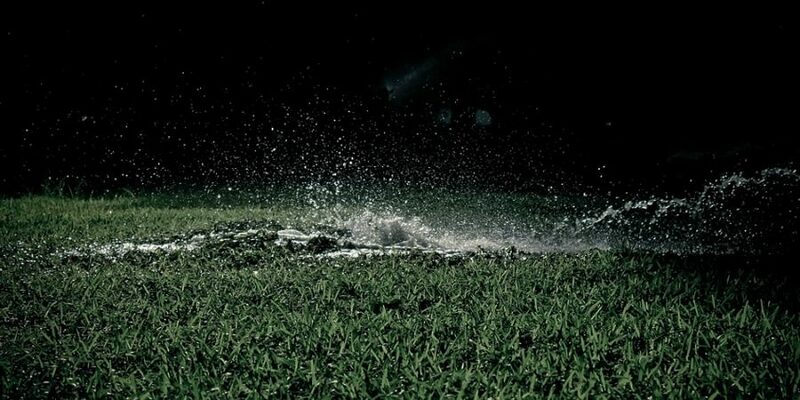 If it’s the first time you’re looking for a lawn sprinkler, you may be feeling a little lost. This is understandable, with new equipment usually comes new terminology. Below we’ve listed a few popular terms when it comes to lawn sprinklers and broken them down for you. “Application Rate“- The application rate refers to how fast your sprinkler system applies water to your lawn. Some landscapes and foliage require a faster or slower application rate. “Application Patterns” – The application pattern tells you how the sprinkler applies water and covers the ground. Application patterns are round, square, or rectangular. “Coverage Area” – The coverage refers to the main areas of your landscape that need to be managed. It’s important to know your coverage area before choosing a new lawn sprinkler to make sure that you get the best sprinkler for your lawns particular needs. “Rotating Sprinkler” – Also known as a Rotary Sprinkler this sprinkler type spreads water in a circular pattern uses multiple streams of water to cover the ground. “Impact Sprinkler” – Has a long spray, circular rotation and wide distribution area for even coverage over a wide distance. There are a few examples of impact sprinklers above. If you have a larger landscape to cover over a long range, you may want to consider an impact sprinkler. “Pulsating Sprinklers” – Provide 360-degree coverage and come equipped with a spiked stake for installing in your preferred location. Affordability – Make sure that you are getting the best value for your money by choosing a sprinkler that meets your individual landscape needs and fits within your budget. Ease of Use – Choose a system that is easy to use and maintain unless you plan to use a professional landscaping service to manage your system. Extendability – If you have or are considering a large or oversized yard, consider purchasing a lawn sprinkler that can be connected and used in conjunction with a series of sprinklers for the best coverage. Portability – If you have a smaller yard with harder to reach areas a portable sprinkler is a good way to reach hidden and hard to water areas. Accessories – Adding a timer to your lawn sprinkler will assure that your lawn is watered on a consistent basis for a healthier landscape. Now that you know some important key terms and what steps to take you are ready to buy your next lawn sprinkler. As long as you follow the guidelines below you should be able to make an informed buying decision and purchase the best lawn sprinkler that suits your individual needs. Be sure that you measure your yard to determine your coverage area. Determine the amount of water that your unique landscape, plant life, and foliage needs. Choose a sprinkler that falls in line with your lawn coverage needs and your budget. For first time gardeners looking to learn more about lawn sprinklers you might find this wiki page useful. Affiliate Disclosure: we are participants in the Amazon Services LLC Associates Program and earn from qualifying purchases. This comes at no added cost to you but helps us to fund the websites running costs. You can learn more here. Gardenknow.com provides information and guidance from the experience of our authors. This is not professional agricultural advice. For more information read our website policies.